Though I know of many who disagree, pink & red has always been one of my favorite color combinations. So when this new coat arrived, I knew I wanted to wear it first with some pastel pink pieces. If you’re wary of trying these hues together, just start small – instead of hot pink & siren red, go for a cherry/blush pairing like I did here. It creates a much less jarring contrast…and also happens to be perfectly festive for the upcoming holiday! Love it! I think pink and red are great together. I also like the polka dot pants! Love pink + red together too! The snood is so perfect. This is a very romantic look. I love pink and red as well, and the polka dots just make it so fun. Lovely! I like your pants and coat very much! Such a great outfit! I am one of those people you are referring too. I think my mother engrained it in me that the two colours didn't belong together. You have paired the hues perfectly and I think my mind is changed. Oh my goodness this look is amazing. You look absolutely stunning! You really look fabulous, so classy! Whereas red&pink or red&orange are not my personal favourites, I do like your subtle and much more elegant version of red&pastel pink! When I saw the post title I must admit I was scared – but this is really nice. 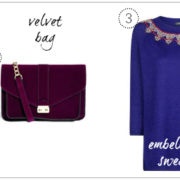 This is the perfect Vday outfit! 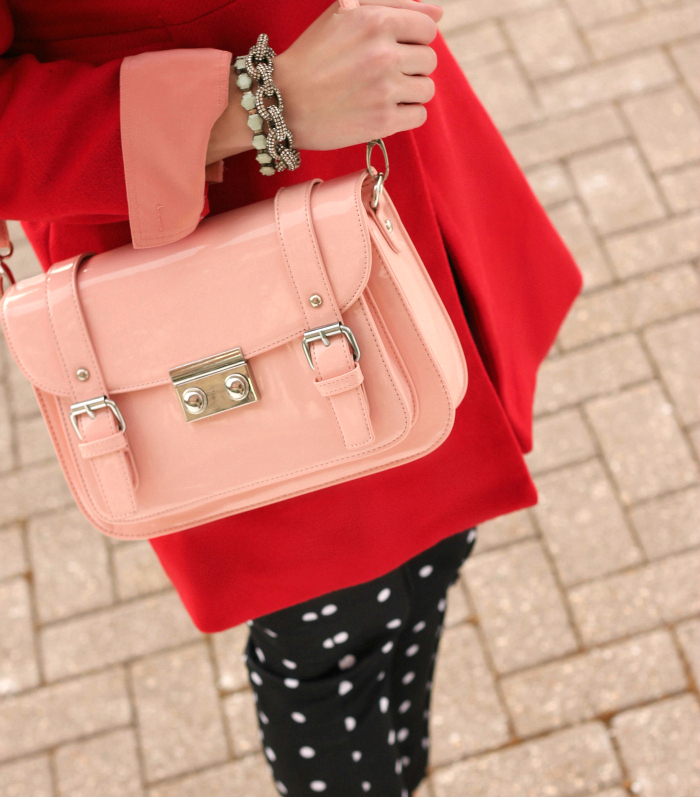 Love the polka dots with the red/pink combination! xo. i think this pink/red combo works for you! the pale, blush pink i think is key! Hope you had a great weekend with the family. Love this color and coat on you. Pink and red done right is beautiful and as always you did it right. My mother often tells a story about me as a child, telling a stranger that "pink and red clash". But after seeing several pink and red ensembles (including your lovely look), I think my childhood color sense is changing! Great pants too! You look great (and cozy)! Really cute look, you always dress so nice! I love that bag! And you're right, pairing blush with red is perfect and slightly less jarring. But I do think a bolder pink is doable; maybe you should style something like that later this week! Those polka dot pants with the jacket are amazing! Love the snood and the purse is such a pretty color! Pink and red is such a beautiful combination but I have yet to wear it. I might just have to give it a try for Valentine's Day. I love how you chose soft shades to pair together. That coat is really pretty on you. This whole look is just so pretty. I think the coat and the colour are what really make it work. I am jealous of those that can make a snood look good. I just look like I have a furry fat neck. I personally love pink and red together, but I'm not one to follow fashion "rules". I think the softer pink and red look great like you paired it.. And I am in love with your purse! I need that in my life lol. This look is really beautiful :)) Love how you combine it! I've always liked hot pink and bright red together — but I never thought about pairing a softer pink with red. I love the outfit you've created here! Looks great! I love pink and red together! The pastel pink is a nice take, usually hot pink and red are paired together. I am dying over that red coat! The cut and color are pure perfection!! Love the coat and your purse is so cute. Love this combo! I've been wearing a lot of burgundy and pink but why not try red!! This look is amazing! I love, love, love red and pink together and it's perfect so close to Valentine's Day. Loving that F21 bag as well! Yep! Pretty sure I adore everything about this look! Such classic colors but with a modern twist. Looking gorgeous! Adore everything about this look… that coat is so gorgeous! Super cute coat!! It looks so cute with the snood! Love this color combo. Especially the light pink – it's a little more unexpectable. Also love your polka dot pants! Ooh, I'm such a sucker for a polka dot pant! What a great look — I'm so glad to have just discovered your blog! your red and pink combo is perfect! I have a pair of polka dot leggings! I don't know what to wear them with though! you look stunning. Love this ensemble! great blog! newest follower on bloglovin. adore your pants! you could pull those into any outfit and make them look amazing! Such a cute look! Loving your coat and how the sleeves of your blouse peek through! Love the color combo! You look so classically beautiful in red, fur and polka dots.. So Tippi Hedren!! L.O.V.E.!!! You look absolutely gorg!! Red suits you for sure! Those pants. shoes. coat. SO beautiful. I love this outfit! omgosh! I ADORE your outfit! That coat is super gorgeous! And I love your polka dot pants! I've been looking for some. Super cute! I love the outfit! And,I just got the bracelet from Coldwater Creek. Thanks for sharing your finds.